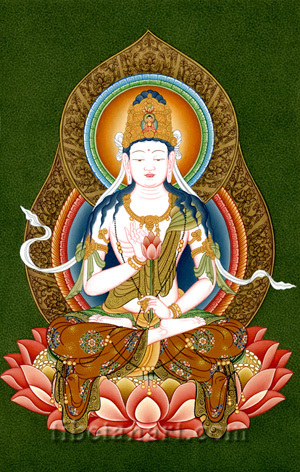 As Kannon he is shown here seated in vajra-posture upon the seed-head of an open pink lotus with thirty-two petals. He is peaceful and radiant white in colour, and wears lower garments of embroidered silks, a folded silk shawl that is draped across his left shoulder, billowing silk ribbons that adorn his crown and armlets, and many ornaments of gold, jewels and threaded bodhi-seeds. His blue-black hair is piled up into a topknot with loose strands that hang about his shoulders, and his ornate golden crown bears the small image of red Amitabha Buddha, the 'Lord of the Lotus Family' of which Avalokiteshvara is the principal Bodhisattva. His aura and halo are decorated with inner rings of lotus petals, with entwined lotus flower motifs adorning the outer arcs of his aura and halo. With his left hand he holds the stem of a red lotus that blossoms in front of his heart, while with his right hand he makes the teaching gesture of 'turning the wheel of the dharma'.